Have you warned someone about Jesus Always? How did they respond? 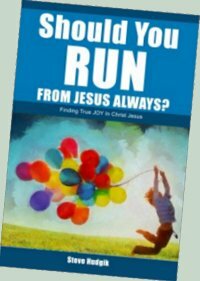 Have you spotted an error in the "Should I Run From Jesus Always" book? Please let me know about it. Should something be added to my book, to better warn others about Jesus Always? Here is what one person had to say about Jesus Calling: The Jesus of Jesus Calling matches the description of a demonic spirit guide to a tee. (click for more). I'm interested in hearing from you. I'd like your comments and suggestions, as well as stories about Jesus Always. I can't promise to answer every email, but I'll do my best as time allows. My ministry at the church has to come first..
Any story you send may be used in a future book, article, or web page. Your name and contact information must be included so I can get in touch with you should I have questions. Only your first will be used in any book or article, unless you specifically give me permission to use your full name and give you credit for what you've said. This new book, "Should I RUN From Jesus Always," should be available for purchase before Thanksgiving.